John Claughton, Chief Master of King Edward’s School, Birmingham has been crowned the ‘Best Head of Public School’ at the annual Tatler Schools Awards 2016. 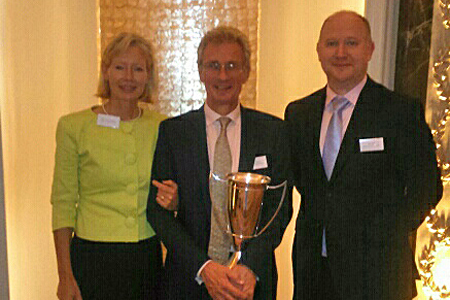 The award ceremony, which took place at the Dorchester Hotel in London on Monday 14 September, saw John awarded the title ahead of competition from Heads of Cheltenham Ladies’ College, Merchiston Castle School in Edinburgh, St Edward’s Oxford and St Swithun’s School in Winchester. On receiving the award, John Claughton said: “I am not sure that the Tatler has a big readership amongst the parents of boys in this school, but I am thrilled to have received this prestigious award. It’s not often that this award finds its way north of Oxford and I think this reflects the remarkable nature of the School, not of its Head. The award is a fitting accolade to John, who will retire in August 2016 after 10 years as Chief Master at King Edward’s School. During his leadership of the School, there have been major developments in all aspects of school life. £8.5 million has been raised for Assisted Places from alumni so that the number of Assisted Places has doubled in five years. Also through the support of the alumni the school has built an £11m performing arts centre, a £5m science and modern languages centre and a £2.5m hockey pavilion and astro pitch. In 2010, the School also took up the International Baccalaureate Diploma for all boys in the Sixth Form to replace A-levels. And, exam results at GCSE and IB are at a record high. King Edward’s School is also shortlisted for the TES Independent School Awards 2015 in the ‘Best independent-maintained school collaboration’ category, in recognition of the School’s extensive outreach programme which engages with almost 11,000 children within the local community each year. The TES award winners will be revealed at the end of November 2015.